Acne is a common skin disease characterized by pimples on the face. It occurs when the pores of the skin become clogged with oil, dead skin cells, and bacteria. 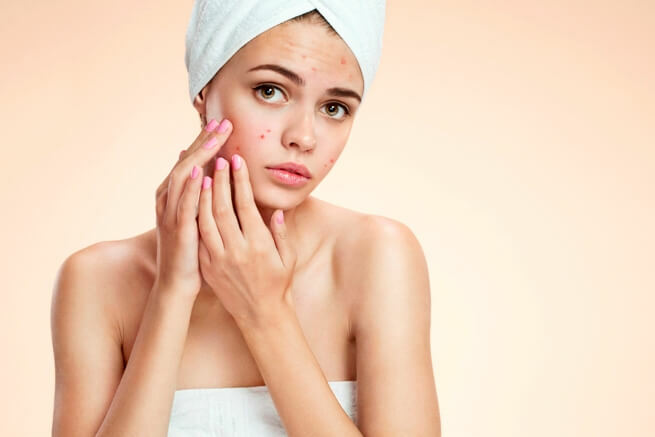 It also occurs when the sebaceous glands are inflamed or infected in the skin; in particular, a condition characterized by red pimples on the face. Comedones are small, flesh-colored, white, or dark bumps that give skin a rough texture. They are found at the opening of a sebaceous follicle or the pore. Papules are raised, red bumps on the skin that do not contain any pus or fluid. While Pustules are papules that become infected and contain pus. Nodules are hard, large, painful lumps which are often very red. A nodules occurs when the wall of a hair follicle is torn, allowing oil and cell debris to get into the lower layer of the skin known as the dermis. Cystic Acne is similar in appearance and feel to nodules but is much more serious due to the presence of cysts.